Before performing factory reset we must know why are going to this and what is the need and what will be the result. So, in this post I try to explain Factory reset and its output for you. Factory reset steps for each Cisco phone model is similar but not exactly same so be careful while performing factory reset. Unplug both the network cable from the back of phone and plug both the network cable back. Release # key and immediately press 123456789*0# . after moment phone should be starting to display phone UPGRADING.. if so it means device performing factory reset if no then you need to look back again in factory reset steps and check to retry factory reset. 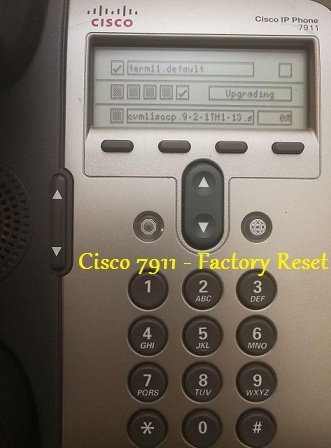 Thanks for reading Cisco 7911G Factory Reset . Please share...! 0 Comment for "Cisco 7911G Factory Reset "